It's Frosty or is it his brother?? We loved our girl's new monogrammed snowman dress so much that we wanted to create a boy's outfit to coordinate. 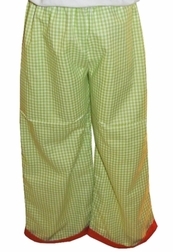 We've taken a red shirt and paired it with lime green gingham pants with red cuffs. 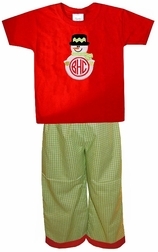 The shirt is appliqued with a snowman wearing a warm scarf made with lime green gingham and snuggly lime green gloves. His black top hat is decorated with a green gingham zig zag trim to match his scarf. The cutest part?? 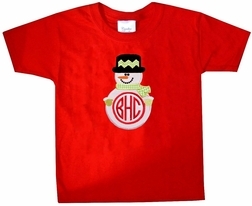 The snowman's tummy is monogrammed in red with your little one's 3 initials.